I'm really excited that Rachel of Hello, Chelly and I have teamed up once more to bring you a brand spanking new collaboration that involves two of my favorite things - New York City and food. We're proud to introduce Table for Two, where the two of us will be highlighting restaurants and dessert spots in New York City. You'll be hearing our personal opinions on the place and the food, as well as where you can go to try it out for yourself! This month (and a day late, sorry! ), I'm going to be talking about Barn Joo, while Rachel tackles Squish Marshmallows. Right off Union Square on the West Side lies a surprisingly spacious Korean BBQ and tapas place called Barn Joo. I'd never noticed it before, but when Rachel suggested it as an option for our dinner place this month, I was game. 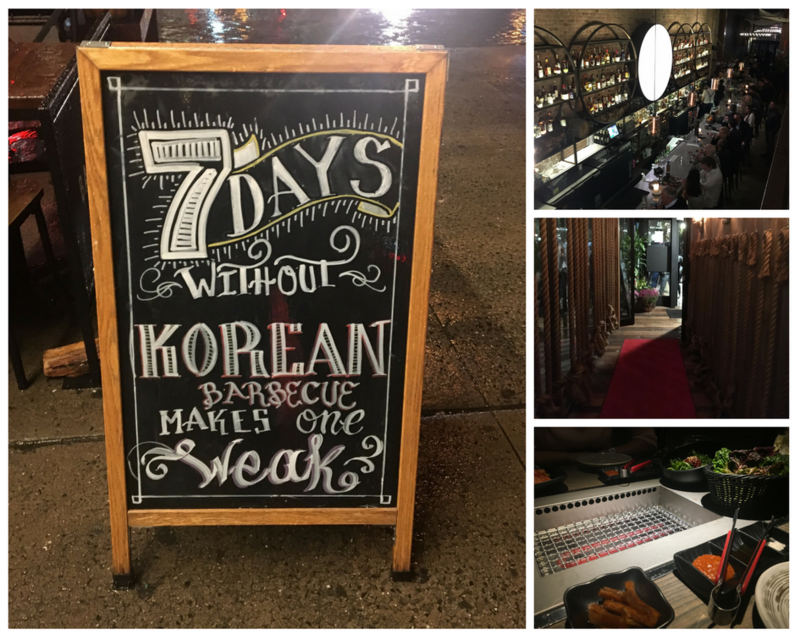 I'm a huge fan of Korean BBQ, and this place sounded downright delicious. The entryway is narrow and, in the dark of night, dimly lit and decorated with ropes on both sides. But when you break out into the main part of the restaurant, you'll be pleasantly surprised to see that there is a spacious bar area and two levels for dining. It's bigger on the inside (Doctor Who joke, anyone), which is pretty impressive. For our visit, we were seated up top, which gave us a great view of the bar and was a little quieter than the already busy downstairs area. We had the garlic truffle fries (which were just the right amount of crunchy and flavorful), the bulgogi mushroom pot (which was perfect for the cold night and incredibly tasty), as well as marinated pork short ribs for our BBQ fare. Everything was perfect for sharing and tasted great! If you're a Korean BBQ fan, you'll definitely want to hit up this place for a visit. Barn Joo actually has two locations - one in Union Square (35 Union Square West, New York, NY 10003) and one in Midtown (34 W 35th St., New York, NY 10001).